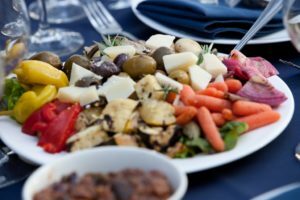 8 Reasons to Hire A Caterer | Need help? | Throw a stress free party! Most people have experienced catering at weddings and bigger parties. What businesses and frequent party-throwers know, however, is that catering can be the perfect solution for a business lunch, corporate gathering, BBQ,, or even a smaller, dinner party. Here are the top 8 reasons why you should strongly consider hiring a caterer for your next event. This is the big one! We all need more time in our day, and until someone adds that 25th hour, it would be nice to hand off some, or most, of the party details to a professional. Caterers are the people that can actually make your food and beverages look like the pictures on Pinterest. They have the skill and the patience to make your vision a reality. You, also, know they are not going to forget seemingly obvious things like, you know…napkins. Safety is a serious issue that can involve anything from food allergies to knowing how to chill the shrimp cocktail. Caterers are trained, licensed, and certified in food safety. It can be something you don’t think about in comparison to thinking about your grocery list…until you’re the one who left out the egg salad too long. Catering companies know how to create a menu, pair wine, and plan desserts. While it’s fun to dream about the perfect party via recipe blogs and Pinterest, executing that vision is a whole different ball game. A caterer can take your ideas, theme, and preferences and make them into a seamless, easy party full of memories, not stress. With a caterer, there’s no entire fridge of leftovers or running out of buns for the hamburgers (gourmet, drool-worthy burgers). As long as you give an accurate guest number estimate, they are going to know the right amount of food and drinks to bring. No begging people to take an awkward plate of food they’ll have to balance on their lap on the way home. Wouldn’t it be nice to mingle and converse with your guests? A caterer serves, continually picks up stray glasses and plates, and leaves you to chat about that business deal or your kid’s soccer game. There is a satisfaction to having a clean kitchen at the end of the evening. It’s even more satisfying when you don’t have to do it yourself. In a business environment, corporations want to see your multi-tasking talents in other ways – not how well you can wrap leftovers. The kind of party you envision, or need a little help envisioning, is just as important to the caterer as giving you excellent customer service. Always wanted to throw a backyard movie night? Family-style Italian dinner? What about a posh BBQ? Your caterer works with what you want, helping you create a memorable event uniquely “you”. For those of us who are “doers,” handing over the reigns to a caterer can be an intimidating thing. However, the benefits of hiring a caterer for your next party are great! Consider your next event and how a caterer may be the right choice! I like your point about how hiring a caterer leaves no mess to clean up. My sister is planning on having an Indian-Style event at her home next week and is looking to get a caterer. I’ll be sure to explain the benefits to her as she looks for a professional Indian food caterer. For our next family reunion, I want to get a caterer to come and feed everyone. Like you said, there is less planning. I also like that there is no clean up for me! Thanks for the tips to choose a catering company for our next family event. There are 12 of us excluding the kids and I’ve never cooked for that many people in my life. I agree that I could maybe suggest some menu options, but hiring a party catering company would really make the whole night seamless and a lot less stressful. My son is throwing a huge party for his 10th birthday, and I was so concerned about entertaining the kids that I forgot about feeding them. I’m glad you said that catering can help you enjoy the party and make memories instead of being stressed. Maybe I can find a sandwich catering service that can deliver to my house so I can enjoy my son’s big day, too. My daughter is having her rehearsal dinner, and I think that being able to get some catering would be really good for us. I’m glad you talked about how there is going to be enough food when you have catering, as long as you give an appropriate estimate. I think that being able to find some good rehearsal dinner catering would take a lot of stress off my wife, so I’ll have to make sure we find someone and get them a good estimate! Thanks! There’s a company event that will be happening next month, and I was tasked to do all the necessary preparations for it. I wasn’t sure about what to do with the food since I was deciding whether to hire a catering service or cook the food ourselves since there aren’t many employees anyway. It was great that you mentioned that food caterers offer more food safety because they are certified and licensed to do so. I’m beginning to think that it’s a better option. Thanks for sharing. I’ll take note of this.